Hey guys! Hope that your year is off to a great start! 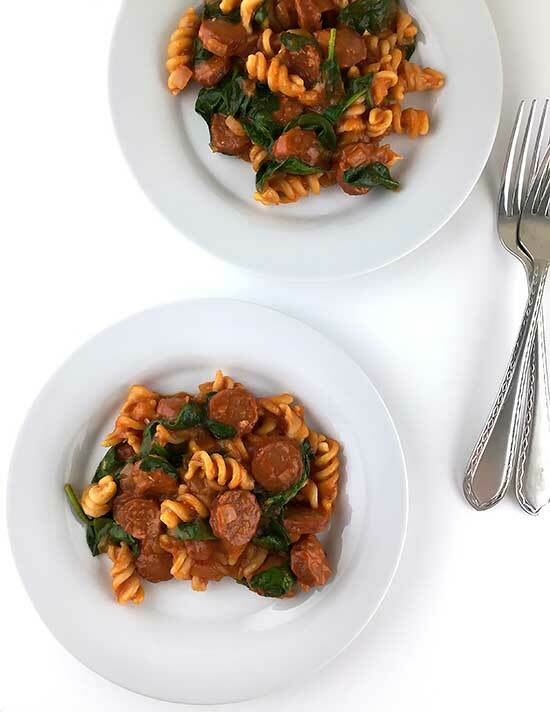 Today, I have a super easy, spicy and delicious one-skillet pasta recipe for you. It’s a little something that I whipped up one night last week. I didn’t really feel much like cooking one evening, so I just threw this together. I went ahead and took pictures just in case it did come out great, and boy, I’m glad I did! Love it when that happens! 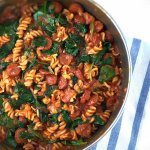 This Andouille Sausage and Pasta Skillet really could not be any easier to make. There’s no extra pot to clean, and it’s ready in about thirty minutes. That’s why I love coming up with new varieties of skillet pasta recipes. Once you have made a few, you can kind of get a feel for how much liquid you might need. I’ve mentioned before how I started cooking these kinds of dishes after I saw a recipe for one over on the Mediterrasian site. Andouille sausage can be pretty spicy. If you are feeding young children or people who don’t care for spicy foods, you’ll probably want to substitute a different type of sausage. The sausage is the main component when it comes to flavoring the sauce, so just substitute whatever you prefer. I like the 100% grass-fed andouille sausage from Teton Waters Ranch. The cooking time may vary based on the type of pasta that you use. I’ve cooked with a variety of brands of brown rice pasta, and they don’t all the cook in the exact same amount of time. I used the Natural Grocers store brand of brown rice pasta for this dish. You’ll just need to check on the doneness after it’s been cooking for a bit. Also, you will need to stir this a few times while it’s cooking to keep the pasta from sticking to the pan. Heat the oil in a 10-inch skillet over medium-high heat. Add the onions, andouille sausage and cook until the sausage is lightly browned, about 3-4 minutes. Add the garlic and saute for about a minute more. Pour in the strained tomatoes, water and pasta, season with sea salt to taste, bring to a boil, reduce heat to medium, cover and let cook until the liquid has been absorbed and pasta is tender. Cooking time will vary depending on type of pasta used. 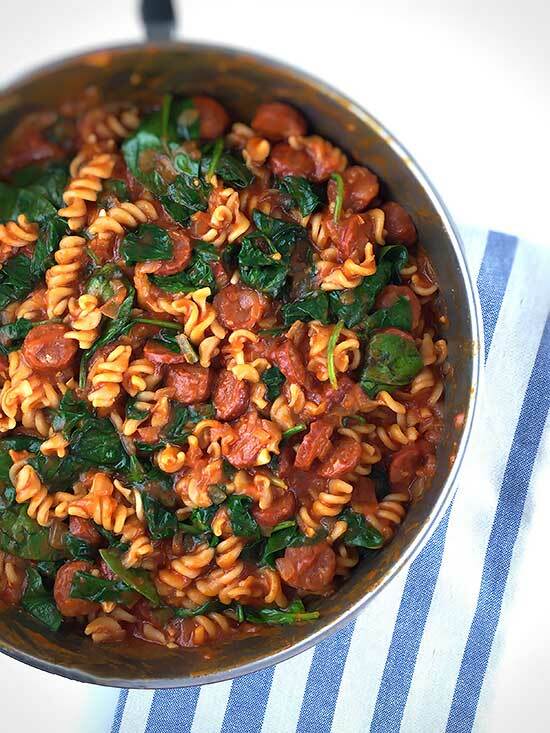 Brown rice pasta can take anywhere from 15-20 minutes. Taking a handful at a time, stir in the chopped spinach and cook until it has wilted, then serve. By Tempie at June 17, 2017 .